Mahout and elephant, mutual training, a couple for life time. The elephant must be four to seven years old. The shaman (there is very little left in Laos) chooses the most favourable day to build "school" because it is a teaching that the elephant will follow. A ceremony, the baci, is organized. It is run by the oldest village. In addition to the usual accessories, are added twelve silver coins, the payment for the master trainer. We build the school, a roof, a cage. We are looking for a godmother. The shaman celebrates a new baci, looking in the village for a woman with great qualities: hard-working, gentle, intelligent, female, in short all the criteria that the elephant must have. He addresses the elephant, explains that he must become like this "godmother", adopt all the qualities. He explains the same thing to the godmother, and for three days, the elephant and she, although separated, will do the same things at the same time: toilet, work, meals and sleep. All the mahouts say that the animal inherits even the defects of his godmother! For example, if she is a runner, he will run away; if she is angry, the elephant will be too! Thus persuaded of the reality of this mimicry, it is better understood that the choice of this person is decisive. We expect a favourable day for a third baci. From this day, the godmother must not leave her house. The model shaman in the clay a whole series of miniature animals, he puts them in a boat made of banana leaves, then removes a hair from the animal and places it in the boat. His assistant goes at full speed put this boat in the water. He starts again the same operation with the urine then with the droppings of the elephant. The speed of the launch is important. Then he jumps on the animal’s back, on his head, and rubs it with a living hen which he will then release. During training, the shaman will talk a lot to the elephant. He has the gift of communicating with these animals. He also sleeps in a cage next to his pupil. A box is then built in the school, consisting of four sturdy posts adapted to the size of the pupil-elephant. Ten elephants blessed during the baci are brought into the school: five will surround the mother, supporting her "morally" the loss of her baby and stay with her for more than a week; the other five will take care of the baby. 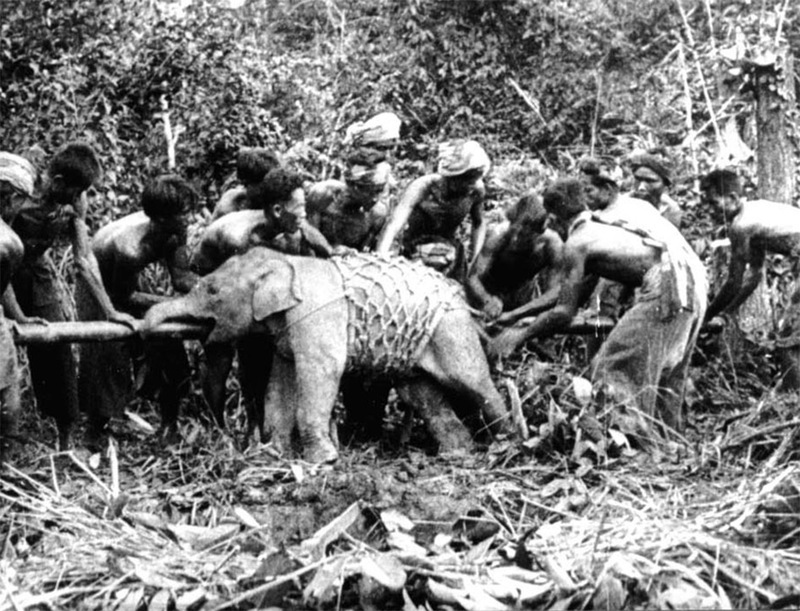 To get the elephant in the box, we attach to the back leg a rope on which we pull to advance. He goes to bed, he does not want to enter. A new rope is then tied around his neck and pulled back. In order not to fall, he is obliged to advance. You can also use an elephant to push it. When he has finally entered, he is fastened on all four legs to the posts, an iron bracelet attached to one of them. To accustom him to this obstacle without hurting him, one takes care to withdraw it from time to time. The verbal learning begins: "niok tin" (raises the paw); As long as the animal has not responded by the action, the trainer pricks it lightly with a pointed stick. If we want him to learn quickly, he is prevented from sleeping. For this two straps are slid under her belly, one at the front and one at the back, both fixed at the top of the posts. A third supports the neck. His mahout gives him food and drink because he can no longer feed himself. The shaman prepares a herbal paste that he inserts into pieces of sugar cane (secret recipe). When the elephant has understood the gesture that should respond to this order, it is detached, but he must not move away from school. He must learn the commandments. To the order "doun say", he must go to the left, at the same time we pull his left ear. If he does not understand, the top of the opposite ear is slightly pricked with a nail attached to the end of a board. Same thing on the right: "doun what". To make it progress, we say "pay" and the mahout shakes his ears with his feet. If that’s not enough, you sting your buttocks by repeating "pay". To make him go back, we tap him on the top of his trunk and we say "retreat". To make him raise the paw he is stung under his foot and he is told: "niok tin". And so on. Then, it will be enough to say the word, without corresponding binding gesture. The stimulation with the foot will suffice once the learning is completed. 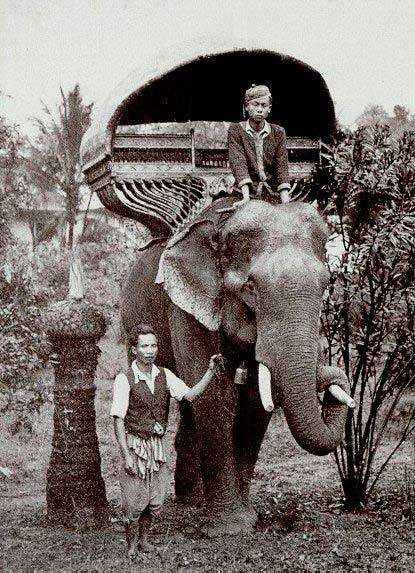 When all orders are integrated, the elephant can finally get out of school. A new baci celebrates the event during which he chooses his name. One writes on three pieces of sugar cane three different names which one throws in front of the animal: the one which he chooses first will be his. Of course, then, he hastens to eat the others; Elephants are crazy about sticks of sugar cane! It can record up to fifty orders, and even more.